Breakfast has been called the most important meal of the day. It is the first thing that many of us do in the morning. When you have house guests or a brunch party, you are forced to get up early and cook, when you would rather get your beauty sleep. 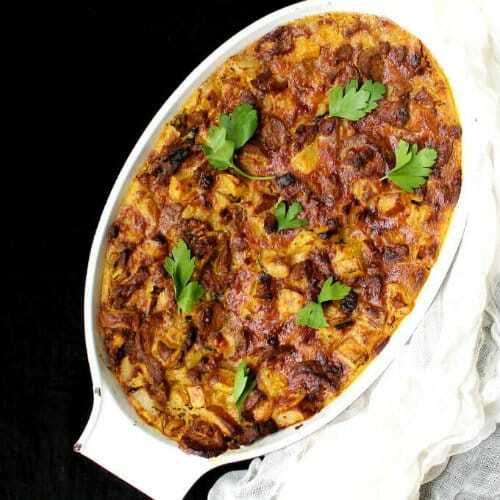 We have collected some recipes for vegan breakfast casseroles that you can make ahead of time. Hopefully, these recipes will make your morning and life easier. 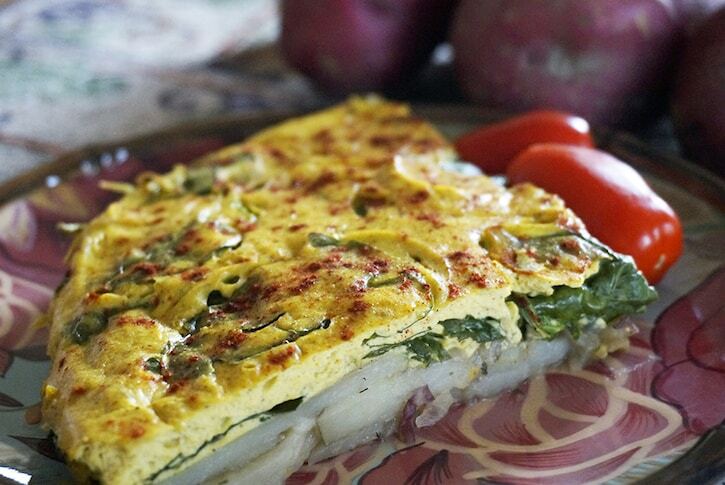 To start, Laura Theodore’s oven-baked Vegan Potato and Spinach Fritatta, shown above. With a delicious potato/onion base, paired with an herb-infused egg-like filling, this egg-less entrée is a true winner, perfect to serve for any meal of the day. This casserole hits all of the breakfast comfort food criteria. Hearty potatoes, smokey BBQ tempeh, tofu eggs, and vegan cheese come together to create the perfect vegan breakfast storm. This can easily be made the night before and popped into the oven first thing in the morning. Enjoy! Not all vegan breakfast casseroles need to be savory. 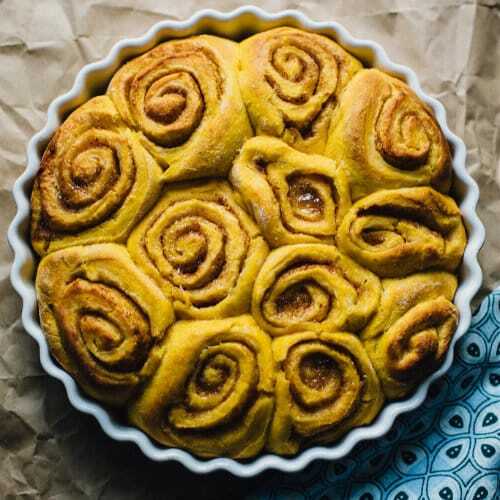 These pumpkin cinnamon rolls have “overnight” right in the title. these delicious little confections need to sit overnight so that the yeast can raise the dough. These rolls will be great with a nice cup of hot coffee on a cool fall morning. Our friends at PETA have put this delicious recipe up. 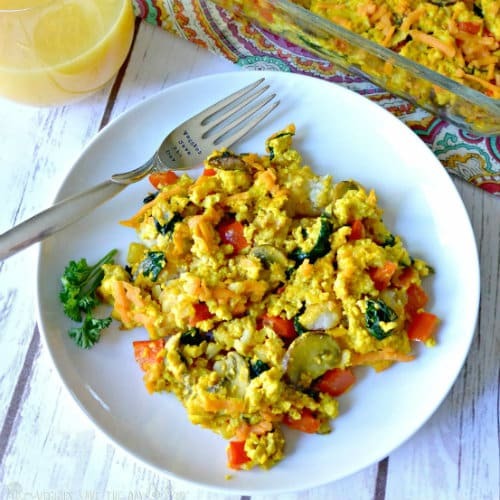 This is among the best vegan breakfast casseroles that needs to be made ahead of time. This casserole will get more like bread pudding when you refrigerate it overnight. The article has a list of several options for egg replacements that is very helpful. 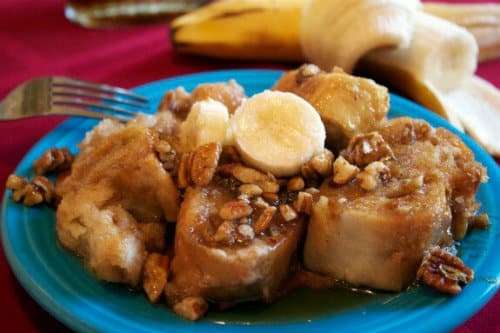 They used a mix mashed banana, applesauce, and a store bought egg replacement to make this, and that sounds amazing! We hope that this conjures comforting memories and warms your morning. What could be better than hash browns and vegan Italian sausage smothered in a “cheesy” sauce? That is what this recipe offers. This is like a vegan hash brown casserole with sausage (vegan). It would be a great main or side dish for a breakfast or brunch. This casserole will definitely break your fast with its hearty and comforting goodness, and you can make it the night before too. 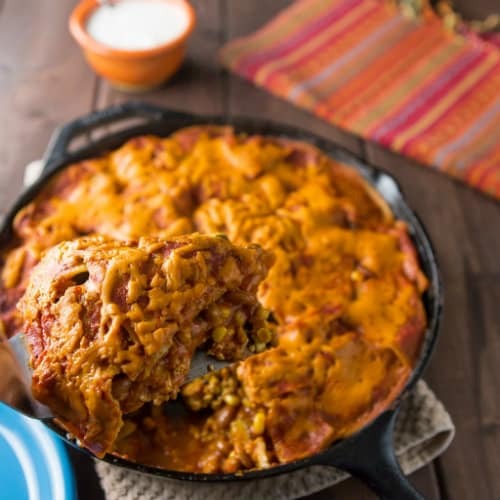 This is a zesty south-of-the-border offering on our list of vegan breakfast casseroles. This is also a great source of protein, and it uses corn, beans and squash with a tofu scramble and vegan cheese. This make-ahead dish is a delicious way to spice up your brunch. This tasty dish is somewhere between a frittata and a quiche. 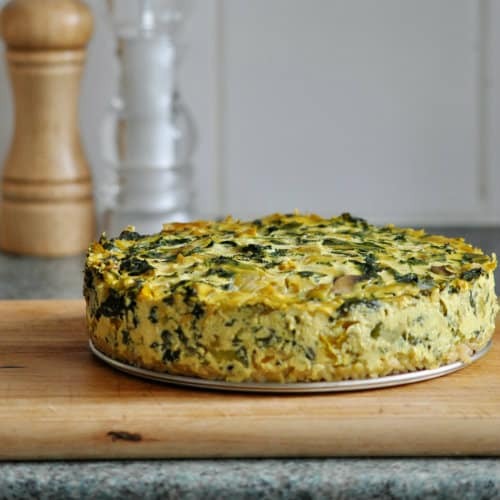 It has a brown rice crust, and it is loaded with Delicious and nutritious veggies. onions, peppers, mushrooms, spinach, kale, AND basil make an appearance in this recipe. However, you can add or subtract any vegies that you prefer. To make it ahead of time, you can cook it the night before and reheat it in the morning, or keep it in the fridge and bake in the morning. What could be better than tater tots smothered in a vegan tofu scramble loaded with veggies and vegan cheese? Not much. This recipe will be a big hit with the kids, and you can make it the day before too. These individual casseroles can be done ahead of time and baked in the morning. The flavors of appricot, ginger, and rich almond butter make these filling and delicious. You can even make them ahead and heat them up for a busy work-week breakfast. 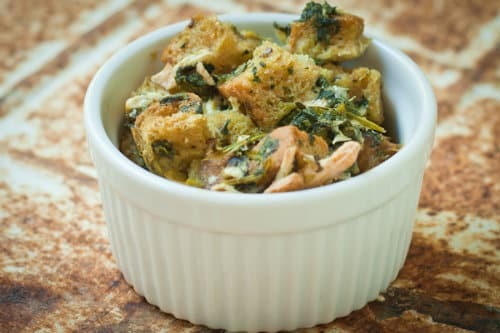 A strata is traditionally an egg based casserole with bread in it. This recipe uses tempeh bacon, mushrooms, and spinach tossed with bread and silken tofu “scrambled eggs.” make this ahead of time and bake first think in the morning. 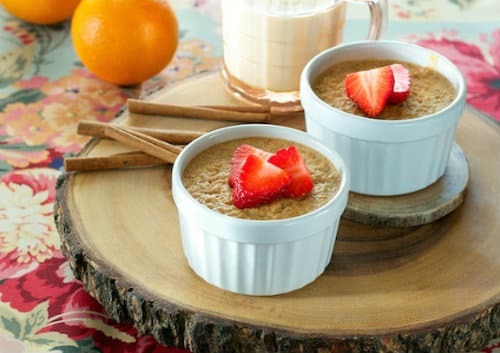 This is a great brunch dish, and in individual baking dishes, they can be baked during the week for a warm breakfast. 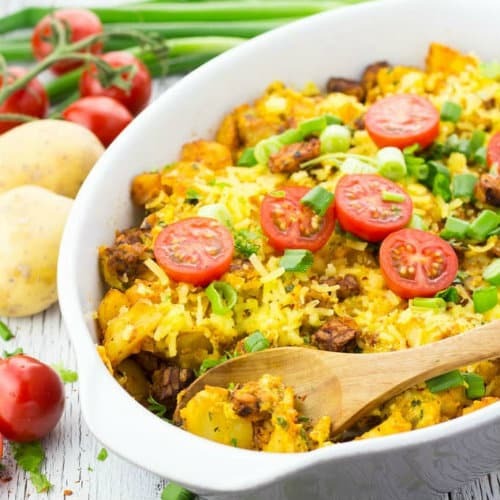 We hope that we have inspired you to try some of these great vegan breakfast casseroles that you can make ahead. That brunch party will not be so stressful with these recipes in your arsenal. I want the recipe for the picture at the top! What is that? Joan & Clare: I believe this is the recipe for the picture at the top. Not vegetarian/vegan, unfortunately. My sincere apologize that my colleagues at VegKitchen used a non-vegan photo. Bad idea! I’ll ask them to replace it. The photo of the casserole at the very top of this post – the recipe is nowhere to be found and I’d really like it. Please respond, ASAP, to my email address with this recipe, thanks so much! Why in the world would you post a photo of a meat casserole on a vegan web/blog site? It makes absolutely no sense whatsoever, and I am completely disappointed in you. It’s a slap in the face to animals and VegKitchen. Nava would NEVER have let something like this transpire. Thanks for catching that, Carol. I’m only minimally involved with VK at this point and this isn’t my post. I have gone ahead and replaced it with a great recipe from the site by Laura Theodore and it should show up within a few hours. Ugh, sorry! !